The newly appointed President & Chief Executive Officer (CEO) of the Development Bank of the Philippines (DBP), Ms. Cecilia C. Borromeo, is a consummate development banker. 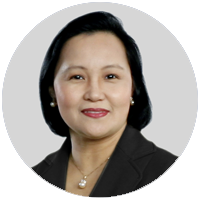 She brings with her a wealth of experience in the field of development banking and finance gained from her 28 year stint in this field since she started her career with the Landbank of the Philippines (LBP) in 1989. Prior to starting her career with the LBP, Ms. Borromeo has spent 9 years working with the Government with the following positions: Settlements Assistant of the Ministry of Human Settlements (1980-1981); Development Management Officer, Human Settlements Development Corporation (1981-1982); Unit Head, Management & Technical Services Unit, KKK National Secretariat (1983-1986); and Trade and Industry Specialist, Operational Planning, Department of Trade and Industry (1988). Ms. Borromeo’s career with the LBP was a colorful one. She started as Project Assistant, Program Management Department (1989); Account Officer, Financial Institutions Department (1990 to 1991); Assistant Vice President, Commercial Credit Management Dep’t (1992 to 1993); Vice President, Commercial Credit Management Dep’t. (1994 to 1998); Vice President, Domestic Banking Credit Group (1997 to 1999); First Vice President, Local Government Financial Service Dep’t (LGFSD) concurrent Domestic Banking Risk Management Office (March 1999 to July 2000); First Vice President, Credit Policy and Supervision Group (July 18, 2000 to January 30, 2002); First Vice President, Account Management Group (January 31, 2002 to Feb. 28, 2005); Senior Vice President, Global Banking Department (July 27, 2005 to December 31, 2008); Senior Vice President, Account Management Group (March 1, 2005 to July 15, 2008); Senior Vice President, Institutional Banking & Subsidiaries Sector (July 16, 2008 to December 31, 2008); Executive Vice President, Institutional Banking & Subsidiaries Sector (January 5, 2009 to June 30, 2012). Ms. Borromeo was the Executive Vice President, Agricultural and Development Lending Sector (July 1, 2012 to January 3, 2017) of the LBP prior to her appointment as President & CEO of the Development Bank of the Philippines (DBP). Ms. Borromeo finished her Bachelor of Science in Agribusiness from the University of the Philippines (UP) and Master in Business Administration from the De La Salle Business School. She also took up Advanced Bank Management course at the Asian Institute of Management (AIM) where she was recognized with the following Awards: Superior Performance; Best Presentor of Asset and Liability Case and Most Professional Trader. Ms. Borromeo has also completed the following Special Courses: Pacific Rim Bankers Program, Executive Education Foster School of Business, University of Washington, Seattle Washington and San Francisco, California, USA; International Study on Rural Banking and Finance, Massey University, Wellington, New Zealand. In addition, she has also attended various training programs in Europe, USA and the Asia-Pacific region.